Well it's been a while... we finally moved in and then were caught in a flurry of boxes and Thanksgiving turkey and hanging picture frames. But I wanted to share some of our photos... first of the dining table, which is shockingly perfect and amazing. I know the photos won't do it justice, but the design is perfect, the finish is gorgeous and the price was very fair. 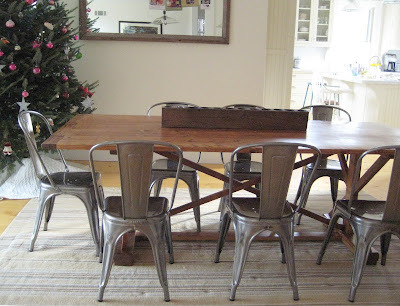 I love the industrial chairs (Tolix, via the Sundance catalogue). And I adore the hanging lamps too, although they need some adjustment to get them to hang straight. I bought some blown glass lamps from Pottery Barn and had the chains removed and replaced with vintage nylon cord in a lime green (hard to see). Here is one shot of my gorgeous kitchen with its vintage French pendants from RT Facts and it's butter-thick (as in 2 inches +) white marble. The view from my sink (do you like the old swim baskets???)... I need a cushion obviously. Our foyer with its too-small table (alas everything from our house in San Francisco is too small). But I love the prints from my great grandmother's book, News from Notown. The dog also loves the new house... do you like the vintage Thonet children's chairs?